By Selah Maya Zighelboim Would you like work for The New York Times? Or write for a fashion site? Or maybe you think it sounds like fun to make money testing apps. Currently, all of these jobs are available to UT students through Campus Job, an online startup that connects students to paid and part-time jobs available on campus. The jobs on Campus Job are tailored specifically to students and provide them with an opportunity to develop skills, while building a resume and making money. Campus Job’s New York City headquarters approves every listing on its site to make sure that it not only is a legitimate position, but also something students would be interested in. Most of the jobs are campus representative positions with startup companies, but Campus Job representative Jasmin Escher says the site is looking to increase the number of local businesses that advertise job listings on the site. Right now, the only local job for UT students is with Snap Kitchen. To set up an account, students need a .edu email address. Upon registering, students input some basic information, such as their GPA, majors and minors, languages and skills, as well as answer some questions about their favorite work experiences, favorite classes and a personal fun fact. Students submit all of this information and their resume. Often, businesses also require additional information. 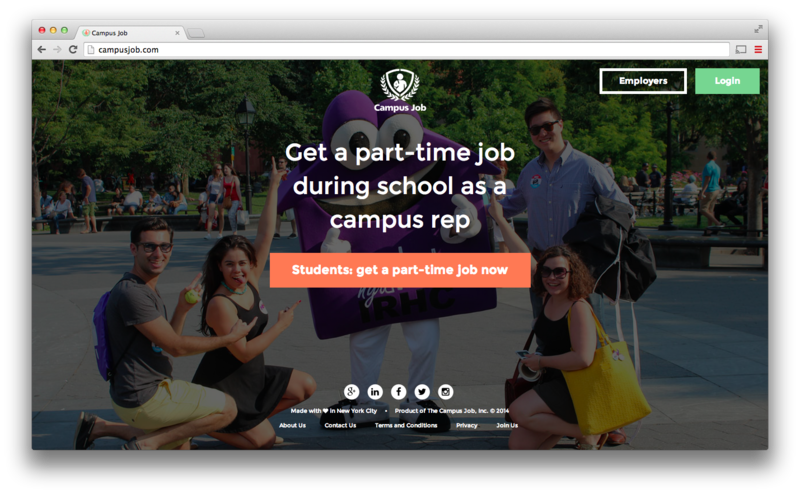 Campus Job officially went online in mid-September and since then has launched at more than 7,000 post-secondary schools in the nation, with students from almost 500 campuses signed up. One-third of students registered with the site check it several times a week, and 96 percent of visitors who log on explore multiple pages of the the website. Businesses have listed over 2,000 part-time jobs on the site, with more than 1,000 new listings every week. The page for UT Austin currently has 50 positions and there are more being added almost every day.